One person was rescued after a KC-130 refuelling tanker and a F/A-18 Hornet fighter jet were involved in a 'mishap' during scheduled training. Six US Marines are missing after two military jets crashed in an unexplained mishap off the coast of Japan. The two Marine Corps aircraft may have collided mid-air during a refuelling exercise gone wrong, U.S. officials said. At around 2am local time, Japanese search and rescue teams were launched to find the aircraft and crew. 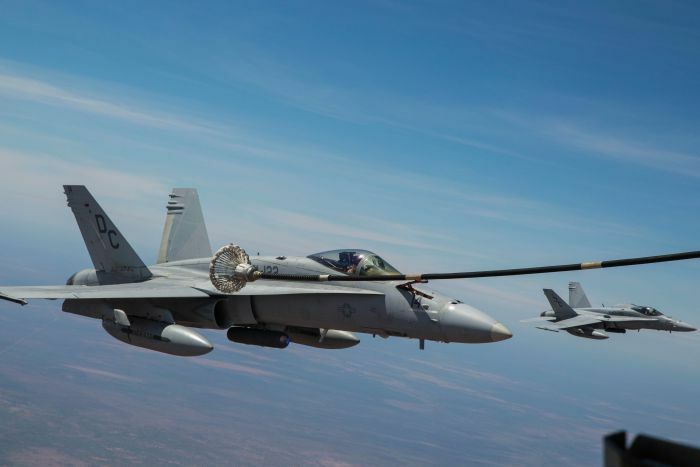 The Marine Corps said a KC-130 refuelling tanker and a F/A-18 Hornet fighter jet were involved in a 'mishap' during scheduled training. Japan's defence ministry said that its maritime forces had so far rescued one of the seven Marines who were aboard the two aircraft at the time of the incident. Search and rescue efforts were ongoing, U.S. and Japanese officials said.